It was the society event of the season when two sisters married two brothers. The brothers were James Lawrence Isherwood and Gordon Leyland Isherwood. The family was well-known in shoe business. The girls were Mary Banks and Florence Banks, whose family was, and still is, in the funeral undertaking business. The Isherwood and Banks families were known to many in their hometown of Wigan. The romance had been a whirlwind affair. 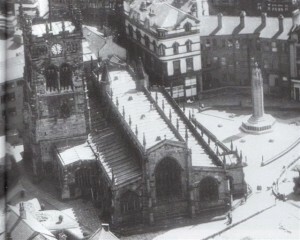 The worst of the war was over, and on June 28, 1944, hundreds gathered outside Wigan Parish Church to witness the grand event of a double wedding. The entries are on Page 123 of the Church marriage register for 1944. All the drabness was suddenly overtaken by the glamour of romance. Gordon was 24 years old, Royal Air Force fitter, married Mary (Molly) and Jim,27, described as a shop assistant on the marriage lines, married Florence. The two bridegrooms lived at 151 Wigan Lane, Wigan, with their parents. The brides were both married from home at 617 Ormskirk Road, Pemberton. The Isherwood boys’ father, Harry Lawrence Isherwood, was described as a boot and shoe repairer. The girls’ father, Richard Banks, as a taxi and funeral director.